THE happenings in Punjab during the last few days do not portend well for the state. They have all the characteristics of a drawn out battle, unless tackled well in time. It is not our aim to apportion blame or find fault with the responses and antics of the various groups that have come out on the streets in several towns in Punjab. There is no doubt that wrongdoers, however powerful they may otherwise be, need to be punished, and punished severely at that. THE Supreme Court has referred all petitions challenging the central law that provides for 27 per cent reservation for the OBCs in institutions like the IIMs and IITs to a Constitution Bench. In the given situation, this is the best the court could have done. It gave an indication of its mind when, during the hearing, the court said that it was not averse to having a close look at the issue by a larger Bench. THE Supreme Court’s directive to educational institutions to eliminate the archaic practice of ragging has once again brought this menace into sharp focus. The court does not want any mercy to be shown to those indulging in this heinous activity. On the other hand, it wants the educational institution concerned to take the responsibility of filing an FIR if the parents or guardians of a victim are not satisfied with the punishment given by the institution or if the sufferer is unable to file an FIR on his own. Despite the Niagara of words on UP’s historic election and Mayawati’s magnificent victory in it, an inadequately noticed feature of the event is the commendable role of the Election Commission in holding free and fair elections against very heavy odds. For, successive regimes in Lucknow, like their counterparts in Bihar, have created a virtually unbridled ambience of volatility, violence and all-embracing lawlessness. Yet the EC completed its arduous task adroitly. Sometime back, I had an occasion to spend around three months in Saudi Arabia, the conscience-keeper of Islam. All faiths fascinate me. I am always keen to know what makes religions such a mighty magnetic force. So, while in the land, I went through the holy Quran and some Islamic literature to have an idea about the faith. Government is, and will remain, central to our society. An efficient, effective and inclusive government is the best guarantor of social justice and an orderly society. The societal primacy of government is also inextricably linked to what is virtually a universal aspiration for democratic governance. Prime Minister Manmohan Singh rarely misses an opportunity to stress to budding civil servants and administrators, the need to improve the quality of governance and tackle head-on the problem of corruption at political and administrative levels. He exhorted IAS probationers to get rid of the old notion of government servants being "Mai Baap". THE happenings in Punjab during the last few days do not portend well for the state. They have all the characteristics of a drawn out battle, unless tackled well in time. It is not our aim to apportion blame or find fault with the responses and antics of the various groups that have come out on the streets in several towns in Punjab. There is no doubt that wrongdoers, however powerful they may otherwise be, need to be punished, and punished severely at that. At this moment our concern is over dousing passions on all sides so that peace and normalcy are restored. 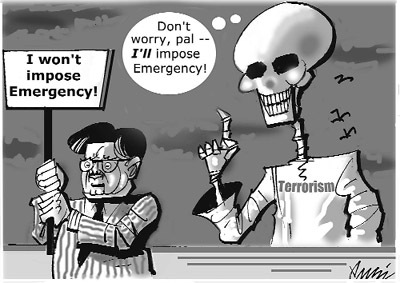 The state had in the past seen how festering wounds could vitiate the atmosphere forcing the common people to pay dearly for the inaction of the authorities. It cannot afford a repetition of the wrongs of the past, for that will bring only misery to the people. Whether truth is on the side of Sacha Sauda or the Sikh Sangat, the fact is nobody is empowered to take the law into his own hands. Whatever may be the size of a congregation, it does not empower it to denigrate icons of other religions or groups and create ill will. Freedom of faith does not allow anyone to act or behave in a manner that amounts to an affront to other groups of people. Secularism is not only about tolerance of the many but also respect for them. Any violation of this cardinal principle will automatically invite provisions of the Indian Penal Code, which the state is duty bound to use with telling effect. In no case can the state abdicate its responsibility of dealing firmly with those wielding lathis and swords. Political parties have a major role to play in the restoration of peace. Chief Minister Parkash Singh Badal could have avoided blaming the Congress for the flare-up in Bathinda and elsewhere just as the Congress could have refrained from pouring oil into the fire as is brought home by some of its leaders joining the mob in Bathinda. As responsible political parties, the Shiromani Akali Dal and the Congress should join hands and bring about a situation whereby peace is restored in the state and there is neither any victor nor any vanquished. In other words, now is the time for all good men to come together to fight the forces of fanaticism and anarchy. A first step in this direction can be an all-party peace committee formed with the express purpose of ending the sectarian clashes forthwith. THE Supreme Court has referred all petitions challenging the central law that provides for 27 per cent reservation for the OBCs in institutions like the IIMs and IITs to a Constitution Bench. In the given situation, this is the best the court could have done. It gave an indication of its mind when, during the hearing, the court said that it was not averse to having a close look at the issue by a larger Bench. Now that such a Bench will hear the case, the Centre, the states and all other stakeholders should present their views before it so that it is able to make a comprehensive study of the entire gamut of reservation and arrive at a suitable decision. Specifically, the Bench will have to examine the criteria to measure backwardness and the basis of identification of beneficiaries. It will also have to examine whether the term “socially and educationally backward” can be substituted by “socially and economically backward”, and whether the Mandal Commission’s creamy layer concept for jobs can be made applicable to admissions also. Opinion is sharply divided between the government and the anti-reservation groups on the subject of reservation. The Centre and the states may have the right to enact laws for the welfare of the backward classes. But the question is how long should quotas continue and whether the government can peremptorily do so at the cost of the poor among the upper castes. Not surprisingly, the apex court maintained on Thursday that the government “cannot adopt any bullying attitude which could impinge on the fundamental rights of the citizens”. The ruling implies that lakhs of OBC students will have to wait till next year to know whether there will be seats reserved for them in institutions of higher learning. But they have no alternative. The apex court had stayed the implementation of the OBC quota for the current academic year. The Centre’s effort to vacate the stay had also failed because the court was convinced that the very basis of reservation (1931 census) was faulty and that it was proceeding in a tearing hurry. Considering the bitterness the issue has caused on both sides, one can only wish that the larger Bench hear all the parties, examine the issue threadbare and adjudicate as early as possible. THE Supreme Court’s directive to educational institutions to eliminate the archaic practice of ragging has once again brought this menace into sharp focus. The court does not want any mercy to be shown to those indulging in this heinous activity. On the other hand, it wants the educational institution concerned to take the responsibility of filing an FIR if the parents or guardians of a victim are not satisfied with the punishment given by the institution or if the sufferer is unable to file an FIR on his own. No doubt, preventing ragging is the collective responsibility of the authorities at all levels. What the court has observed is based on the R.K. Raghavan Committee’s recommendations. The panel, headed by a former CBI Director, was appointed by the Centre under instructions from the apex court, which has approved of much of what the committee has suggested for banishing this ugly practice. Those among the student community who favour the continuance of ragging describe it as mere “fun”, which is believed to help interaction among the seniors and juniors. They must be bluntly told that any activity that can destroy a student’s career and even threaten his life and liberty cannot be accepted as “fun”. Ragging was reportedly the cause of at least 25 suicide cases during the past seven years. The number of those emotionally traumatised by the ragging can never be quantified. The apex court has directed the educational institutions to appoint an anti-ragging committee or squad to keep an eye on the goings-on in the hostels so that no junior student is harassed by his seniors on any pretext. This can help only if the members of the panel include people who are not employees of the institution. According to a survey by the Coalition to Uproot Ragging from Education (CURE), the authorities of educational institutions “prefer to deny ragging incident for face-saving at the cost of the freshers’ trauma”. For them the image of their institution is more important than the life or career of a student. This needs to be addressed to make the anti-ragging prescription effective. No one looks more foolish today than defeated Chief Minister and Samajwadi Party leader Mulayam Singh Yadav, who first attributed the relatively low turnout of voters to the “stringent” security measures taken by the EC, and, on the day of reckoning, lamented that not the electorate but the Election Commission had vanquished him! Except for him, leaders of all other political parties, observers with no axe to grind and the media have praised the EC for its impartiality. To be sure, when the commission announced the election schedule for UP — seven phases spread over more than a month — many, including this writer, had felt that it was yet again a case of a poll too prolonged. In all fairness, this opinion has to be revised. The commission was right in giving the fairness of the poll overriding precedence over its speed. As Chief Election Commissioner N. Gopalaswami has pointed out, during the three-phase UP election in 2002, the EC had to order repolling in at least 100 polling booths, while this time around this became necessary only at half a dozen booths. To ensure this, the commission had found it necessary to devise a “complete security cover” across whatever area voted on a given day. This meant that not more than 55 or so constituencies could go to the polls at any one time. To try to extend the voting to more constituencies would have spread the security cover rather thin, and this would have opened up tempting possibilities for the politico-criminal nexus to indulge in its favourite pastime of booth-capturing, bogus voting and intimidating both the election staff and voters. Stuffing the ballot boxes is no longer feasible because of the introduction of the electronic voting machines (EVMs) but bahubalis (a charming euphemism this for politically influential desperadoes) would surely have seized and destroyed them, had they been given half a chance. The EC merits an accolade because it kept the pampered thugs completely at bay. To make foolproof and knave-proof arrangements was not easy. Consultations with all political parties had shown that no one outside the Samajwadi Party had the slightest confidence in the impartiality of the state police and the UP armed constabulary. The EC had, therefore, to depend entirely on the Centre’s paramilitary forces of which no fewer than 680 companies — or close to half a million men — had to be mobilised. And, of course, they had to be rotated in distant areas, each with its ample share of “sensitive constituencies” as well as regional bahubalis. The CEC is on record to the effect that he was not happy to hold the elections under the shadow of so many guns, but had no other option. However, the matter cannot be left at that. We Indians proudly proclaim ourselves to be the most peaceable people in the world, being inheritors of the legacies of the Buddha, Mahavira and the Mahatma. Yet we can’t vote peacefully. When UP was going through its protracted poll, France was engulfed by one of the most emotive presidential elections. After right-wing leader Nicolas Sarkozy was duly elected President — in the second round of voting — there were protests, some of them violent, in that country. But all through the voting there was not the slightest disturbance at any polling booth. Shouldn’t this put the entire Indian political class to shame? Even before the first of the seven rounds of voting in UP could begin, it was clear that the real danger was of that of “bogus voting”. The evidence was the plethora of names in almost every constituency of men and women who existed only on the electoral rolls meticulously prepared by Mulayam Singh’s men. When the former chief minister complained of voters being “scared away”, he was, in fact, protesting against rigorous checks on impersonation. However, while all is well that ends well, there are at least two questions concerning the EC and Indian democracy that the country must face squarely and without delay. First, there is absolutely no doubt that the Election Commission, like the Supreme Court, is one of the few institutions that have done the country proud and lent legitimacy, even lustre, to Indian elections. Ironically, one reason for this may be that the EC itself is an un-elected body. It is imperative, therefore, that nothing is done or allowed to happen that unnecessarily erodes the prestige and dignity of this august body. The likes of Mulayam Singh Yadav have to be restrained from fulminating that the commission was against him because it was “colluding with both the Congress and the BJP”! Secondly, in making appointments to the EC the government must take care to avoid doing anything that gives rise to the kind of proceedings now taking place in the Supreme Court. These are long-term, indeed enduring, matters. But there is an immediate issue meriting serious attention and early action. As it has been often said, every time seems to be election time in this country. The polls in UP are just over, and Goa is on the verge of voting. Why couldn’t the elections in these two states be synchronised? Later in the year, elections will have to be held in Gujarat, Rajasthan, Madhya Pradesh, etc, to be followed in 2009 by the mother of all elections — those to the Lok Sabha. If it took nearly five weeks to go through all the phases of voting in UP, how much time would the countrywide elections for the Lok Sabha take? The first general election in 1952 (held simultaneously for the Lok Sabha and state assembles) had taken several weeks. Yet the first Chief Election Commissioner, Sukumar Sen, could confidently tell Jawaharlal Nehru that the time was not far off when India could hold a “single-day poll”. In today’s circumstances, that is a pipedream. But surely something can be done to curtail voting time, reduce the number of candidates, bring down the frequency of assembly polls by increasing their simultaneity, and prescribe life imprisonment as the minimum punishment for disruption of elections. What I understood during my brief study was that a Muslim believes that only Allah is worthy of worship and Prophet Mohammad is His messenger. Allah sits on His magnificent throne on the seventh heaven and during the holy month of “Ramzan” He comes to the first heaven to have a closure look at His creation. Thus, the Muslims are advised to be at their best during this period. They are also told that Allah does not have any consort and so, no children. They do believe Christ to be born of the divine will without any masculine intervention, but do not admit Him to be the Son of God. According to Islam, Allah does not share divinity with anybody. He is, thus, in a sort of master-slave relationship with man. Some local intellectuals invited me for a discussion on religion. Many of them had beards really thick and long, but still they seemed to have open minds. They began with the recitation of a few verses from the Quran which I listened to with respect and reverence, as if I was one of them. After all, they were then in communion with our common Creator. At the end of this, some of them confronted with me with their favourite question: whether Hinduism, with belief in the worship of countless things — planets, plants, animals and stones, etc and without any clear cut concept of God — was really a religion? I first referred the questioners to Amir Khusrao’s “Nuh Sipihr” (Nine Heavens) written some seven hundred years back. The celebrated scholar has clarified in this work that the Hindus do worship cattle (cow), plants (basil), stones, etc, but only as His creation and not as God. After all, all life comes from God and in fact, everything that exists bears His touch. Every Hindu prayer is, thus, directed to the same divine reality that Muslim call Allah and the Hindus by numerous names of their own. Thus, their idolatry has a character entirely different from the one frowned upon by Prophet Mohammad which related to the worship of the idols kept in Mecca as God itself. Secondly, I suggested to them to visit one of our “Kumbh Melas” where the largest mass of humanity anywhere on Earth congregates. When they see millions of faces there lit with the same light that they see on the faces of the Haj pilgrims, they would not ask this question again. They seemed to agree and, in fact, had the magnanimity to apologise if they had in any way hurt my feelings. The appropriate role of the state is to regulate, facilitate, and create an enabling environment that fosters development and empowers citizens but does not stifle initiative or enterprise, leaving citizens the room to manage and shape their own communities. The public purpose of the government, i.e. solving public problems, remains the same as before. There is no doubt that the adoption of certain market principles and practices into the functions of government has been beneficial in introducing flexibility, cost consciousness, and responsiveness to the needs of the citizens. While selective use of market practices has certainly helped to make governments more efficient and responsive, the pendulum is in danger of swinging too far to the other side. Like the government, the market too has to be kept in check to prevent its worst excesses. The invisible hands supposedly regulating and self-correcting the market forces is largely a fiction. Markets cannot function without government regulation. For its effective functioning, the market must rely on the government to protect private property rights; to enforce contracts; to provide arbitration in the event of disputes; to manage and regulate patents and trade marks; to facilitate the exchange of goods and services by setting standards for measurement; to create the conditions for international trade; to protect against theft and fraud; and to control the money supply through manipulation of interest rates. There is clearly no such thing as unfettered free market. India’s development has been characterised by persistent inequality. Its record for dealing with the chronically poor and the historically disadvantaged, while substantial, is still far from satisfactory. Caste and class differentials are stark, as is discrimination against girls and women. Public provisioning in rural areas is far worse than in urban centers. The quality of life for a sizeable number of Indians still remains unsatisfactory. The poor remain poor not because the solutions are not there or for want of resources. They are poor because they are not able to enforce their ‘entitlements’. The role of the government in establishing the entitlement of the poor has acquired a greater urgency, especially as many of the functions of the government are rolled back; and many of the activities that it performed in the past have been left to the market or to the civil societies. Our past experience has shown that democratic institutions, affirmative action, and decentralisation are necessary but not sufficient to create an even playing field. Investment in human resources development is essential to enabling the poor to realize their entitlements and to develop their capabilities to take advantage of the opportunities offered by globalisation. The vulnerable groups are unlikely to share in the rising prosperity of India if they are simply left to the mercy of the market. Markets operate for profit and are seldom benign; they invariably produce winners and losers, and it has no responsibility for those who lose. As the sphere of government is rolled back, it invariably follows that the government will be downsized and many of the state enterprises will be privatised leading to losses of jobs now reserved for the members of the disadvantaged group. It is true that as the economy expands and the privatized state enterprises flourish, new and better paid jobs will be created. But in a knowledge-based economy only those who are well educated, skilled, savvy, English-speaking and internationally connected will be able to take advantage of the opportunities. Without a commitment to affirmative action, private sector jobs are unlikely to go to the rural, locally educated person from a disadvantaged background. Market liberalisation without an adequate social safety net is widening the gap between the rich and the poor; and the possibility that the poor will be further marginalised is no longer a matter of speculation. The poor have suffered from the combined failure of the government and the market. We know that even democratic governments are constrained by the powerful elite and interest groups. And neither the government nor the market left to their own devices is able to serve the needs of the poor fully. The poor, to be able to enforce their political and economic entitlement have to be empowered. This calls for mobilisation, community organisation, advocacy and training and building human capacity. It calls for an extension of the affirmative action into the private sector; and a willingness of the government to target the most vulnerable groups through schemes like the employment guarantee scheme. The criticism of affirmative actions, reservations and quota abound (and no doubt some modifications are called for), but as yet no one has come forward with a better solution. The government cannot and must not abdicate its responsibilities to the market but instead revitalise its democratic institutions and processes. USHUAIA, Argentina – This is a place where “The End of the World” sells. The theme is celebrated in T-shirts, bumper stickers, coffee mugs and posters. You can’t get away from it. He’s talking geography, not Armageddon. Ushuaia, situated along the picturesque Beagle Channel in Tierra del Fuego, amid a backdrop of jagged, snow-capped mountains, proclaims itself the world’s southernmost city. 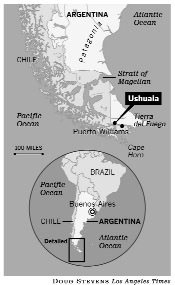 Chilean officials like to make the same assertion about the town of Puerto Williams, a military settlement slightly to the south, but Ushuaia is by comparison a metropolis, home to more than 55,000. Hotels, casinos and travel agencies have multiplied in recent years like the region’s abundant, albeit non-native, beavers. Foreign vacationers, mostly from the United States and Europe, can’t seem to get enough of this rugged and glamorous terrain at the tip of South America. Nonstop flights from Buenos Aires touch down daily. Hundreds of cruise ships now anchor here during the relatively mild months between Christmas and Easter. The number of visitors to Ushuaia approached a quarter-million last year, double the total five years earlier. Once marked on maps as Terra Incognita (Unknown Land), this is believed to be the last place on the globe that prehistoric humans reached by foot as the ice shelf retreated about 14,000 years ago. Over the years, Ushuaia has served as an indigenous campsite, Anglican mission, prison colony and way station for corsairs, whalers, pirates and gold diggers, among others. The Indians, convicts and shipwreck survivors are all gone, replaced by guidebook-toting, exotica-seeking sightseers in waterproof gear and hiking boots. Tourism pumps more than $120 million a year into the economy as the city milks the worldwide eco-awareness boom. Ushuaia has gained global traction as a base to visit receding glaciers, observe penguin and sea lion colonies, follow the path of Charles Darwin and even trek (with sunscreen) beneath the ozone hole, which occasionally extends above the city, though it can’t be seen. Ushuaia is also the southern terminus of Patagonia, another tourist brand oozing cache. Another lure: The deep harbor is a major gateway to Antarctica, an increasingly hip destination for the environmentally inclined. But the onslaught of world-end chic hasn’t shattered the allure – not yet, anyway. Although some unsightly development mars the town, nearby parks and waterways offer access to a largely unspoiled landscape of inlets and moorlands, forests and bays. “There’s something here that touches the imagination,” says Gotz Bernau, violinist and concert-master of the Berlin Symphonic orchestra, seated at a picture window in a pricey hillside hotel as cottony snowflakes fell on the pines outside. World’s End festivals – arts, food, film, theatre – are metastasizing as city promoters sell an alternative to Salzburg, Cannes and Sundance. Leonor Amarante, Brazilian curator of a recently ended event said: “The End of the World is the ideal place for artists to express concerns about the fate of humanity.” Exhibits included the Polar Project, a video installation featuring clips of humans standing on icebergs. There are no icebergs here, still some 700 miles from Antarctica, but these extreme latitudes have long conveyed a sense of wildness and an untamed nature. “The mountains ... rose in one unbroken sweep from the water’s edge, and were covered to the height of fourteen or fifteen hundred feet by the dusky-colored forest,” Charles Darwin wrote almost two centuries ago in what is believed to be a description of Ushuaia. Government servants must become one of the principal agents of social change. If the political class cannot be relied upon to function as the conscience-keepers of the country's value system, then it becomes incumbent on civil servants to perform that role with dedication, he reflected. Can the BJP stalwart and former Prime Minister Atal Bihari Vajpayee tilt the scales in his favour if he is the BJP-led NDA's nominee for the post of President, the highest constitutional office in the country? Certain constituents of the NDA believe that it can be a master- stroke which might not be without its concomitant headaches for the UPA and the Left parties supporting the Manmohan Singh government from the outside. On his part Vajpayee has rejected these suggestions, though it has led to a debate within the BJP and outside about intent and motive. Now that the decision of the NDA's Presidential nominee has been left to Vajpayee, it appears that Vice-President Bhairon Singh Shekhawat is their obvious choice. Shekhawat's keenness to move to Rashtrapati Bhawan is apparent even though it is riddled with imponderables at this juncture. The election to the office of President is by secret ballot in the electoral college comprising the two Houses of Parliament and the state legislatures. At a press conference recently, Union Minister for Earth Sciences Kapil Sibal dislosed that India's efforts to set up a third station at Larsemann Hills at Antarctica had been cleared by the Antartic Treaty Consultative Meeting (ATCH). Incidentally, one of the two other stations in Antartica has closed down. Terming it as a historic step, Sibal observed that a suitable name for the new base is under consideration. "It could be some Sanskrit name," he said. Some mediapersons quipped: "You can name it Rahul". Sibal kept a straight face and maintained a stoic silence. With the prospects of a second term in Rashtrapati Bhawan virtually ruled out, President A.P.J. Abdul Kalam is gearing up to return to his penchant for teaching after his term comes to an end in July. Kalam, in a rare and precedent-setting move, took two classes on nanotechnology at the prestigious Indian Institute of Tehnology at Kharagpur during his recent two-day visit to West Bengal. These classes were for B. Tech, PG and Ph D students. He also interacted with the teachers and students at a function of the National Council of Education of Jadavpur University in Kolkata. In the realm of Ishwara when a man dies, his work stops but his act of charity continues, his spread of knowledge goes on helping the creation and his righteousness keeps a following for him. One may live by any means whatsoever. But one who lives for the good of others lives one's life really truly. The spinning wheel and the spinning wheel alone will solve, if anything will solve, the problem of the deepening poverty of India. God was true in the beginning. He was True throughout the ages. He is true now and will be true for ever. The world is indeed a mixture of truth and make believe. Discard the make believe and take the truth.